Some people have started to wonder whether that’s happened to groups in the conservative movement – and that’s understandable. Reports about sleazy activities by conservative groups have not exactly been in short supply over the last couple of years. Damaging stories have popped up on the Daily Beast, Mother Jones, Washington Post, the Politico and at the Daily Caller among other outlets. Additionally, for those of us who have a lot of friends in the Tea Party and among grassroots conservatives, stories of abuse have become rampant. That may be why you’ve heard people like Ann Coulter and Dana Loesch publicly suggesting that there are groups out there ripping people off. However, the problem with the articles that have come out so far is that most of them have come from liberal outlets and have only discussed limited aspects of a few organizations. That naturally led people to wonder if they were reading hit pieces. As to the rumors, there are always two sides to every story and it’s difficult to know how much weight to place on anecdotal stories. So, I decided to find out once and for all what’s really happening with these conservative groups. Towards that end, I hired an experienced researcher, Jay Batman, to do an in-depth 170 page report on 21 big name conservative groups that we selected. We focused on big name organizations along with other groups that had been targeted in reports by other media outlets. Eventually, after finding that the money issues all seemed to center around the PACs, we decided to drop four (501(c)(3)s and (501(c)(4)s and focus where we were finding the problems. After the research was done, my partner Tiffiny Ruegner and I reached out to all of these groups to give them a chance to respond. A little less than half of the PACs replied, but we did want to get their side of what was happening because the ultimate goal was to compare all these groups in as neutral a fashion as possible so conservatives can decide whether their money was well spent. Very few people are capable of adequately researching this information, some of these groups are quite adept at hiding what they’re doing and there are gaps in the law that potentially allow for some very shady activities to occur under the radar. How can that be? Well, election law is complex, onerous and difficult to follow, but after setting a few clear boundaries, it gives groups a wide latitude in how they spend their money. Additionally, there is also very little public oversight for these groups because figuring out how these groups are spending their money is far too complex for the average person. Moreover, few conservative media outlets are willing to report on what’s going on for obvious reasons. For example, my partner, who helped put this together, once worked for two of the groups that were investigated — Tea Party Express and TheTeaParty.net. She also had business dealings with The Tea Party Army, among others. I’ve worked with theTeaParty.net and have friends, acquaintances and people I’ve cooperated with on various projects at a number of these PACs. Are they going to be happy with us if they lose donors because a report comes out showing that they could have done a better job of spending their money? Probably not. These kind of connections understandably discourage a lot of conservative journalists from digging too deeply into these organizations out of fear they’ll find something that will hurt their friends or sources. On top of all that, it’s always possible that a report like this can turn people off to donating to grassroots groups altogether. 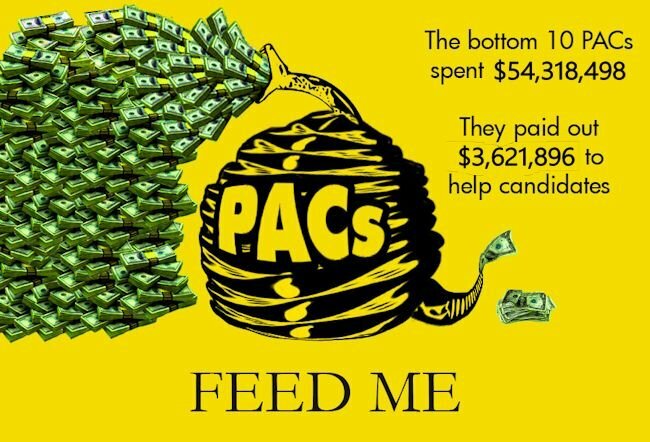 While that’s certainly not what we want to happen, when you start to realize that the bottom 10 performing PACs we researched spent $54,318,498 overall and only paid out $3,621,896 to candidates, that risk is worth taking given how much damage is already being done to the conservative movement. To properly explain what’s going on, we need to give you a few details about the numbers you’re about to see. What you’ll be looking at for these groups is how much money each group spent versus how much of it was used to help candidates via independent expenditures and direct contributions. Charities are graded in a similar way. For example, to get an “A” grade at Charity Watch, a group needs to spend no more than 25% of its money on overhead and fundraising. Sometimes groups do other things as well. For example, Tea Party Express is famous for doing bus tours and William Gheen from ALIPAC said he doesn’t think it’s fair to judge his organization on independent expenditures because ALIPAC’s focus is mainly on research, media campaigns, lobbying politicians, organizing protests, rallying volunteers and other activities that don’t use donor money to directly benefit candidates. While people should certainly keep other metrics in mind, most people would consider the best measure of effectiveness for a PAC to be its independent expenditures and direct contributions. In a world where “victory has a thousand fathers, but defeat is an orphan” every group you talk to can reel off a string of wins and political turning points where it claims to have been a decisive factor. While getting the “Good Housekeeping Seal of Approval” from some of these groups definitely has value because it lets grassroots conservatives know where to focus their energy, the key thing donors should be asking is how much of their money actually made it into these races where it was desperately needed. If you gave a dollar to the gold standard of PACs that we researched, Club for Growth Action, 88 cents of every dollar you gave went to a candidate. On the other hand, there were a number of PACs that gave 10% or less of the money they received to candidates. When there’s a 78 cents per dollar difference in the effective use of money between the top of the heap and more than half of the PACs we researched, there’s an elephant in the room that needs to be addressed. We also found quite a few PACS that made large payments to vendors who were owned by people who worked for the PAC. This certainly can be done for legitimate purposes, but it’s also an easy way to move money around while keeping your donors from seeing what you’re actually doing with it. For example, this is done in some cases to obscure how much people at the PAC are really making. The Senate Conservatives Fund and American Crossroads appear to have done that. However, it can also be a way for PACs to siphon off money. If a PAC officer pays a vendor he owns, he doesn’t have to report what the vendor did with it to the FEC, which means nobody really knows what happens to the money. That’s why PAC payments to vendors owned by people who work for the PAC look suspicious and should set off red flags for donors. It’s a huge conflict of interest. If the independent expenditure you pay yourself looks the same on the FEC report whether you take 10% of it or 90% of it, the temptation will be to keep as large a share of the money as possible whereas an unaffiliated vendor would feel pressure to take as small a cut as possible in order to try to keep your business. It’s also intriguing to find out where some of this money is coming from. For example, one of the reasons PACs like American Crossroads and Club for Growth Action are able to pay out a higher percentage of money in independent expenditures is because there are a lot of wealthy donors cutting them huge checks. That significantly cuts down on their fundraising expenses. If you’re a smaller group raising money from the general public, by necessity your fundraising expenses are going to be significantly higher. Other groups like the Republican Main Street Partnership have found a way to bypass Republican sources entirely for significant portions of their fundraising. This excerpt is from the original 170 page report written by my researcher. Labor unions provided significant funding for the (Republican Main Street Partnership) with Working for Working Americans, the International Union of Operating Engineers, and the Laborers International Union of North America all contributing around $250,000. The United Transportation Union ($30,000), Seafarers International Union ($20,000), were joined by the Teamsters, Air Line Pilots Association, International Association of Firefighters, and various other unions who contributed $10,000. SEIU contributed $5,000, as did the Laborers Union, the Transport Workers Union and various others. After a contentious email exchange with the Republican Main Street Partnership, its COO Sarah Chamberlain claimed that it was receiving union money because it supported “fiscal responsibility and less government.” Since unions don’t actually care about either of those things at all, you can draw your own conclusions about why so much liberal union money is pouring into a Republican group that’s considered to be generally hostile to conservative Republicans. Last but not least before we get into the numbers, it’s worth noting that there are a lot of good people that volunteer and work for these organizations, even the ones that have terrible numbers, and most of them simply aren’t aware of what’s been going on. It’s necessary to say that because we don’t want grassroots volunteers who have no idea what the books look like to be tarred with the same brush as the people running the PACs that are performing poorly. On a personal note, even though I had heard a lot of anecdotal stories and had read what other news organizations had to say, I have to admit that I was shocked by how bad the numbers are for many of these groups. One of the things I realized while I was putting this report together is that perhaps the biggest reason grassroots candidates have been having trouble breaking through in recent years is because such a large percentage of the money that was intended for them is being siphoned off to vendors, wasted, and just plain old pocketed by people in these PACs. This is a wide scale problem that is unquestionably having an enormous negative impact on the conservative movement and it desperately needs to be addressed in a real and serious way. Hopefully, this report will be the start of that process. This is what each organization we researched spent over the course of the 2014 cycle followed by how much each PAC gave to politicians either directly or through independent expenditures on their behalf. Then finally, we have the percentage of their money they spent that actually went into independent expenditures & direct contributions. *1 American Crossroads uses so many vendors who are either employees of the PAC or their surrogates that their real independent expenditure numbers are unverifiable in any meaningful sense. *2 (Note: This section was edited after publication) The Senate Conservatives Fund thought it should get credit for money that was bundled and sent through its organization. Since bundled money is typically pass-through cash that is separate from independent expenditures and generally doesn’t reflect on how well a group is using the money it’s raised, we didn’t include that in the totals for any of the groups. That being said, the SCF may deserve more credit than most for the bundled money it raised because of a quirk in the FEC regulations. Long story short, the SCF reached out to people on its own email list and asked them to go back to its website and contribute to certain endorsed candidates. Because the SCF picked the candidates, that money doesn’t count as an independent expenditure. So, if a significant portion of the $4,712,667 it raised in bundled money came in that way, the SCF probably does deserve credit for it. If that bundled money had been added to its totals, that would have brought the numbers up to a more respectable 49% of the total spent, which would have put the SCF in 5th place overall. SCF also thought it deserves credit for non-candidate issue ad spending. We found $2,735,267 of that type of spending. However, since as a practical matter, issue ads are often just advertising for the group, we didn’t include those in its totals. * 3 (Note: This section was added after publication) There is some controversy over the status for Americans for Prosperity. Our researcher said one of their committees was listed as a PAC at Open Secrets. AFP insists they’re not a PAC, says they aren’t doing PAC spending and says Open Secrets made mistakes with the data. Since AFP was listed as a PAC, we added their numbers, but the data at Open Secrets has changed over time. After getting an email from AFP this morning, my researcher dug deeper into their FEC data and says that it was a mistake by Open Secrets. Actually, AFP’s spending appears to be incorrectly classified 501c4 spending. Update: This is just a note to clarify something based on feedback I just received from one of the PACs that actually did very well in this report. This report heavily focused on the poor performance of the bottom 10 PACs which used 10% or less of the money they spent on independent expenditures and direct contributions. However, there were other PACs that did considerably better and few that did very well. What we were trying to do is to give people an opportunity to compare the performance of these groups, so they could see those differences — and there are significant differences. If you conclude that every PAC on this list performed poorly, you’re not giving some of these PACs the credit they deserve.